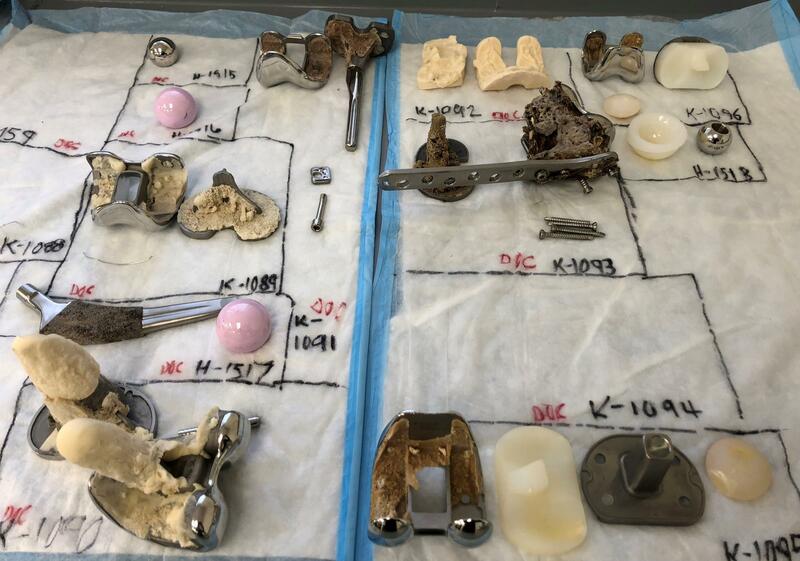 Dr. Matthew Kraay and Clare Rimnac have been collecting discarded hip and knee implants for more than 20 years. Their archive is a gold mine for sleuthing malfunctioning medical devices. The three types of hips replacement options are shown here - metal on metal, which has been discontinued; metal on plastic, the most commonly used; and ceramic on ceramic ball and socket. Each year, orthopedic surgeon Dr. Matthew Kraay implants around 400 artificial hips and knees in his patients at University Hospitals, and he says, each year, for one reason or another, around 150 implants are taken out of people. Those discarded parts end up in his very clean and very new looking lab. Spread before us on a bench are metal knee joints caked with bone-like glue, plastic hip sockets, and dagger shaped metal inserts all recently removed from people's legs. An array of discarded devices await analysis in Dr. Matthew Kraay's lab at University Hospitals. He has thousands more stored on shelves and in super-cold freezers representing more than 20 years’ worth of discarded artificial hips and knees. “I started this when I was a resident and it’s just grown and grown and grown,” Kraay said. He also has a degree in mechanical engineering, and, sometimes, he’s a medical device detective. Any implant can fail, says Kraay, but when he sees two or three similar cases, he says, it’s time to start digging. Patterns that can be revealed by examining devices collected in Kraay’s archive. 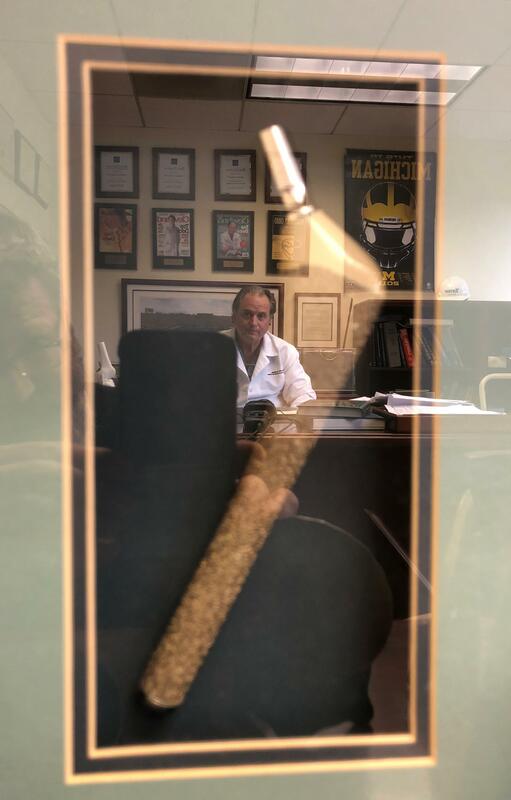 Dr. Matthew Kraay is reflected in a display case of a hip implant he helped develop. He says the multi-component device turned out to be much too expensive to produce and was discontinued. For example, some artificial hips are being removed because of corrosion of the metal stem that holds the ball part of the ball-and-socket joint. “What I’m doing now is, I’m going back," Kraay said. He's pulling all of his cases from the archive that might have shown the same issue known as taper corrosion. Metal corrosion in the body is a bad thing. The FDA in 2012 recommended that doctors stop using metal-on-metal hip devices because tiny bits of metal were wearing off, poisoning surrounding tissue. That’s led to more reliance on another key component of artificial hips and knees, plastic. Clare Rimnac is an engineering professor at Case Western Reserve University and a long-time collaborator with Dr. Kraay. She uses the machines in her lab to test the used plastic parts that Kraay pulls out of patients. That includes her beloved Instron axial torsion servohydraulic testing system. "This bad boy allows us to pull, and compress, and twist, and we can pull and compress and twist at the same time,” says Rimnac. 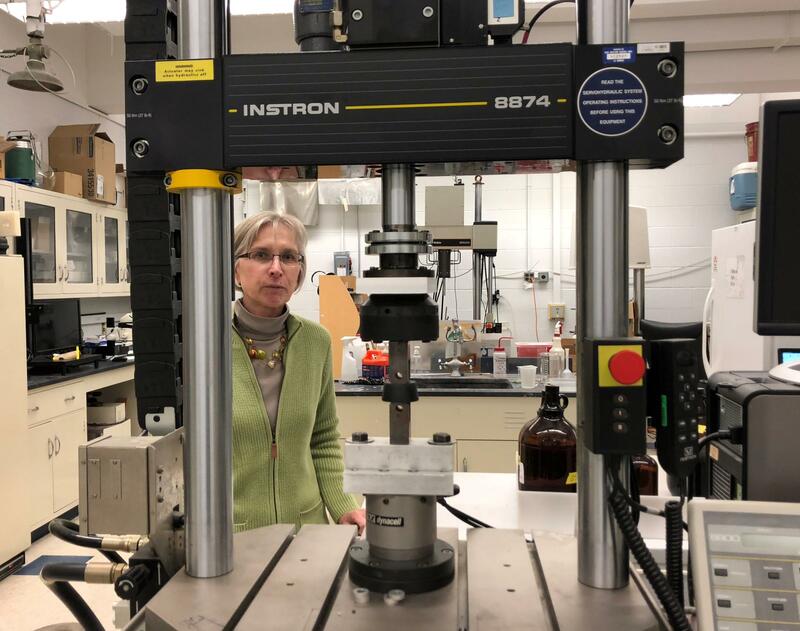 Clare Rimnac is framed by a servohydraulic testing system inside her lab at Case Western Reserve University. The deep grooves inside the artificial hip socket are hard to miss, and obviously not a good thing. Rimnac says manufacturers altered the plastic formulation to avoid this kind of wear, but those changes then made it more brittle. Some device makers responded by making the plastic thicker to prevent cracking, but that means less room for the hip socket, and a greater chance of dislocations. For orthopedic surgeon Dr. Matthew Kraay, there’s a continual interplay of providing his patients with the best technology and making sure that technology won’t cause problems down the road. Ideally, Kraay says, an implant should last a lifetime. We’re not there yet, but he says new devices are likely to last 20 years or more. The implant archive he and Clare Rimnac created is now part of a 15 member national consortium of discarded devices. Kraay says that’s important because the way forward often means taking a hard look back. Support for Exploradio is provided by the Burton D Morgan Foundation.